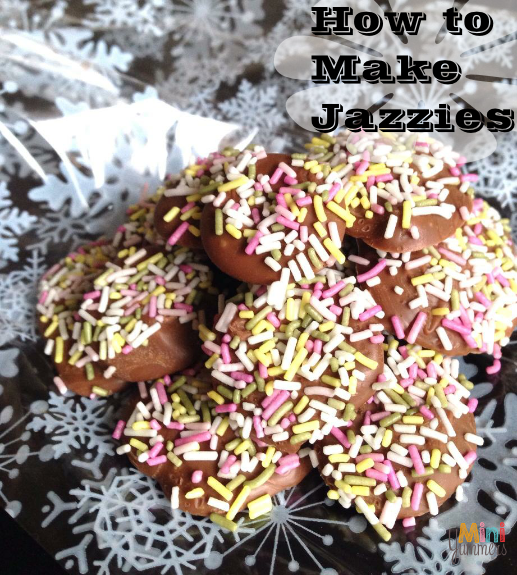 I’ve had a few requests for easier things to make with younger children in mind, and this is perfect for nursery kids and preschoolers 🙂 Making jazzies, or decorated chocolate buttons, is easy peasy, cheap, and leaves the little ones with a lovely edible gift to give to someone at Christmas, Valentine’s, Easter… Anytime is a good time for chocolate! I’ve used sugar strands as it’s what I happened to have in the cupboard, but to be traditional to the original jazzies chocolate buttons you’d need to use hundreds and thousands. But any kind of sprinkles or decorations you have to hand would work well. 1. Break your chocolate into pieces and put it into a microwaveable bowl. Heat the chocolate for 20 seconds at a time, stirring each time, until you have melted chocolate. Put the paper on top of the board or a large plate. 2. Use a teaspoon to spoon some melted chocolate onto the paper. Move the spoon around to make a round shape. These buttons can be any size–we’ve made a mix of regular and large sized. 3. Once you’ve made around 6, you can sprinkle the hundreds and thousands over the top of the chocolate buttons, Press very lightly to make sure your sprinkles stick to the chocolate. 4. Carry on and make the rest of the buttons, and sprinkle over as before. 5. Put your board of jazzies into a cold place. It doesn’t have to be a fridge, just somewhere with a constant temperature. When the chocolate has set hard, you can peel the jazzies buttons off the paper and package up as you wish. 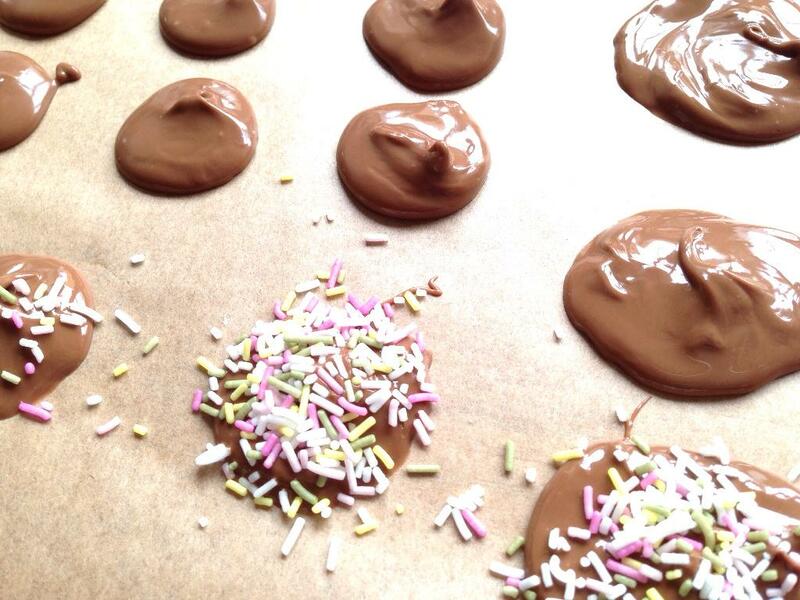 TIP: Don’t make too many buttons before you put your sprinkles on, as the chocolate will start to set and it makes the sprinkles harder to stick. You can also make these with different types of chocolate of course. If you make them with white chocolate then these are called Snowies. Liked this easy-peasy Christmas make?